A savoury recipe! What in the world is going on? It must be opposites day. I was in a baking funk this weekend. There were about 10 bazillion different dessert ideas whizzing around my head but nothing was inspiring me enough to make it a reality. So I went in an entirely different direction and made some homemade sausage rolls. I find it hard to believe this was my first time making them at home. They are so easy and such a classic. 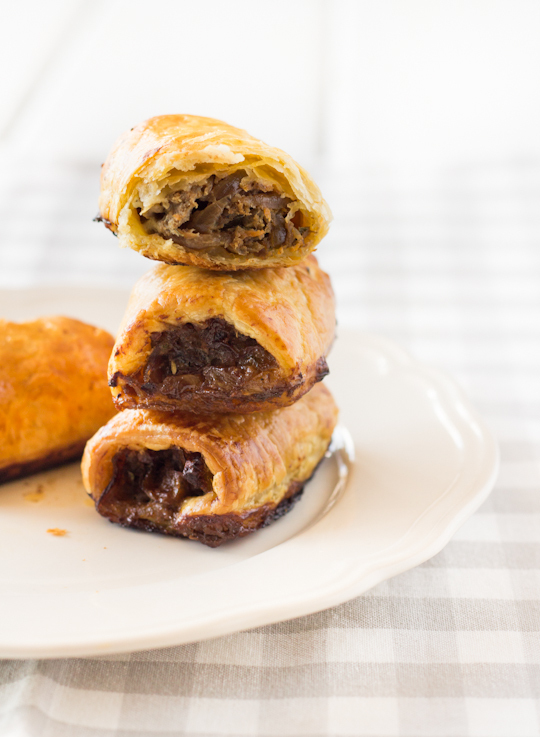 You can't go wrong with a bit of meat wrapped in puff pastry, though it's not the most photogenic of dishes! To mix things up a little, instead of serving them with tomato sauce (the default condiment for all sausage rolls) I got a little bit weird. 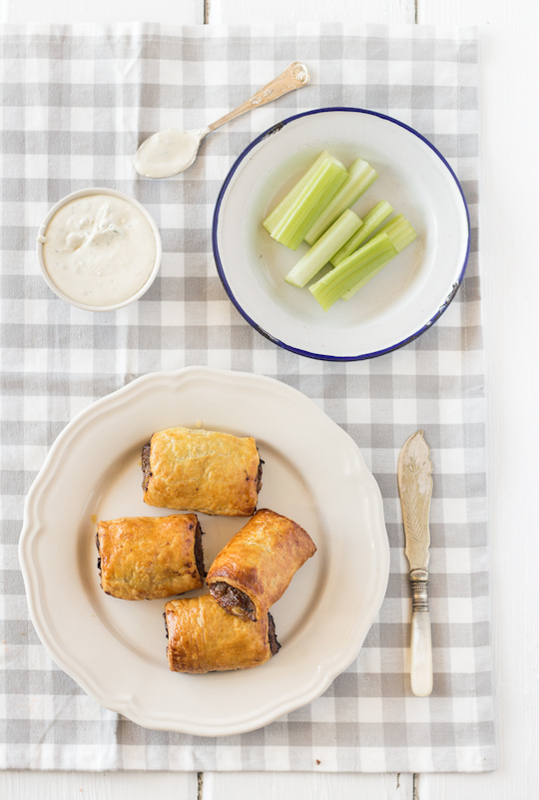 I made these delicious beef and caramelised onion sausage rolls (my sweet tooth still manages to rear its ugly head) and served them with a blue cheese dipping sauce. Don't freak out. It totally works. I knew it would, because one of my favourite dinners is this grilled steak with onion-blue cheese sauce. Even people who don't usually like blue cheese enjoy it. So keep an open mind. Sausage rolls might be one of the few times where I have no issues with using store-bought pastry. It's one of those crowd-pleasing party snacks that you want to be able to make on the day, and making puff pastry from scratch (as amazing as it tastes) can be quite time consuming. So this weekend I cheated and used the frozen stuff. Still deliciously buttery and flaky. I would definitely urge you to try it with the blue cheese sauce at least once. 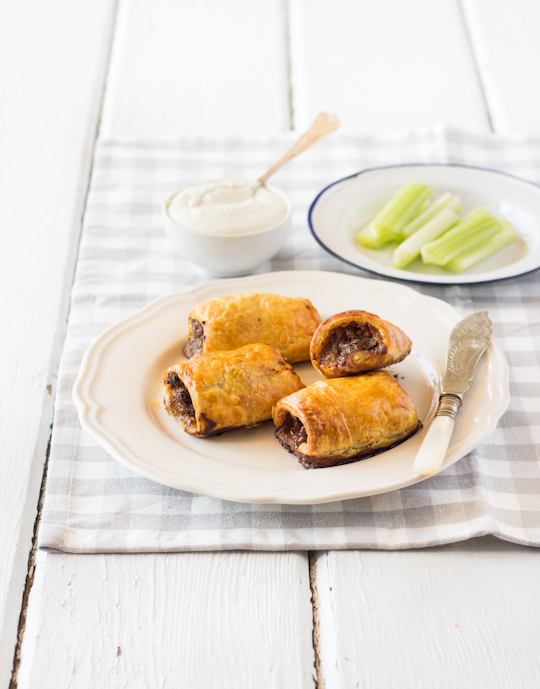 The sausage rolls are actually not very salty on their own because of all those lovely caramelised onion bits, so it really needs the saltiness from the blue cheese to balance it out. If you can't bring yourself to do it, make sure you add extra salt or some cheese to the rolls themselves. 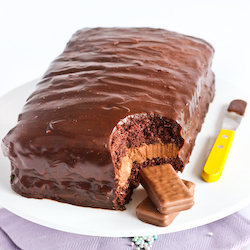 Almost cruelly, the one weekend where I decided to make savoury baked goods for my dessert-averse husband, he suddenly had a craving for chocolate. Bugger. Place butter and olive onion in a large frying pan or pot on medium heat until butter has melted. Add onions and stir regularly until softened and just starting to colour. Add sugar and balsamic vinegar and stir until combined. Continue cooking, stirring regularly until onions are a deep brown in colour, about 15 mins. Transfer to a dish and set aside to cool. Preheat oven to 220°C (430°F) and line 2-3 baking trays with baking paper. Place beef, carrot, parsley, thyme, pepper in a bowl and add the cooled onions. Mix until well combined. Cut pastry sheets in half. Prepare egg wash and brush egg wash along one long edge of each piece of pastry. On the opposite long edge, shape a 3cm diameter sausage of the beef mixture (about 1/6th of the whole mixture). 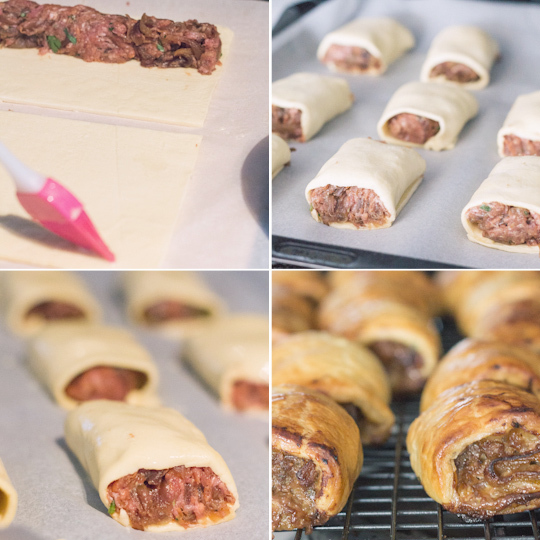 Starting from the long edge with the beef, roll pastry up so that it seals along the edge with egg wash. Cut roll into four equal pieces and place equally spaced on the lined baking trays, seam side down. Brush tops with egg wash. Repeat with remaining pastry and beef mixture. Bake for 20-25 mins or until golden brown and puffed. (You can prepare the dipping sauce below while waiting for them to bake.) Don't worry if moisture/grease leaks out the sides a bit, it doesn't really affect it but you can mop some if it up with a paper towel if necessary. Remove from oven and use tongs to carefully transfers to a wire rack to cool. Best served while still warm and fresh from the oven, but can be refrigerated in an airtight container for several days reheated in the oven or microwave. Place sour cream and blue cheese in a large mixing bowl and whisk together until smooth then stir in parsley. You can adjust the amount of cheese to your liking, I used 120g because I like it strong-flavoured. 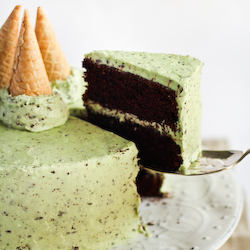 You can also prepare this in a blender or food processor to save time and ensure smoothness. 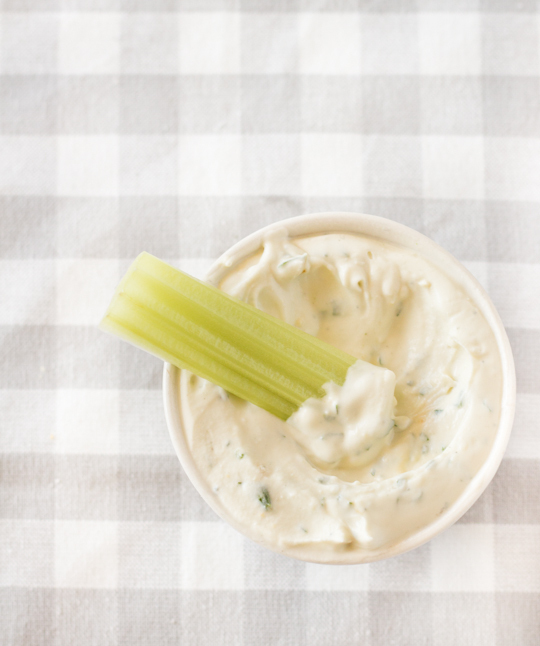 Serve together with sausage rolls, and extra celery sticks for any leftover dip. You are a life-saver! I have had the strongest craving for sausage rolls for the past few weeks, but none of the ones I have seen in cafes looked like what I wanted. 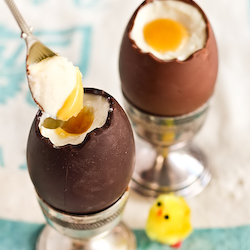 These look perfect, and I am definitely making them ASAP. steph, this would not be a normal recipe for me but your pictures are totally changing my mind! i know you said this dish isn't the most photogenic, but i think you did a fantastic job making everything look pleasing and inviting! 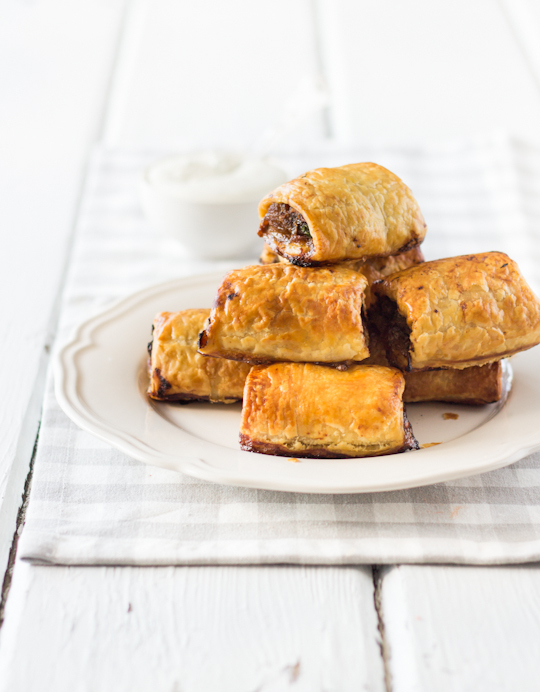 thank you for the sausage roll idea - i hope to try it soon! Looks awesome! Even for something "not photogenic" they still looks delicious. Laura I know exactly how delicious these are! 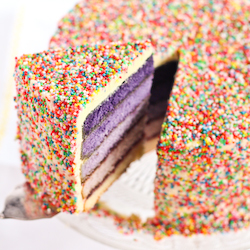 I make a very similar one but mix crumbled blue cheese into the filling. Oh they are good! Will have to try your version with the dipping sauce. Yum! 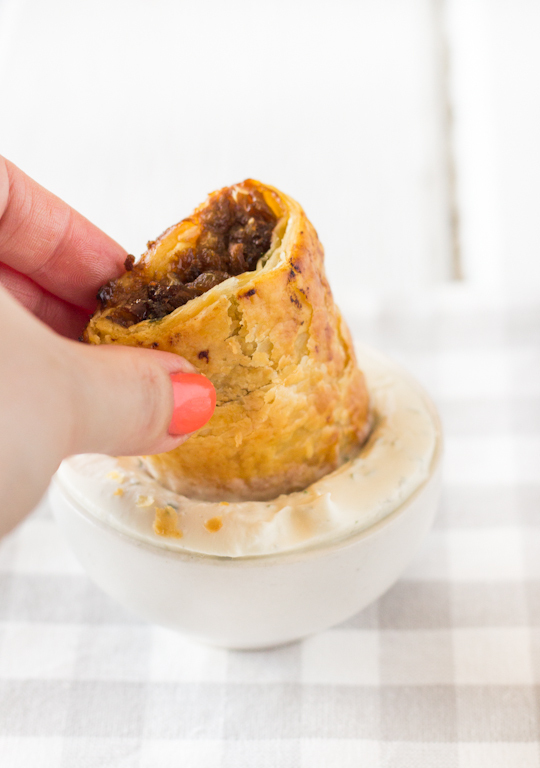 I've never dipped a sausage roll in blue cheese but I can see how it would totally work! Yum. 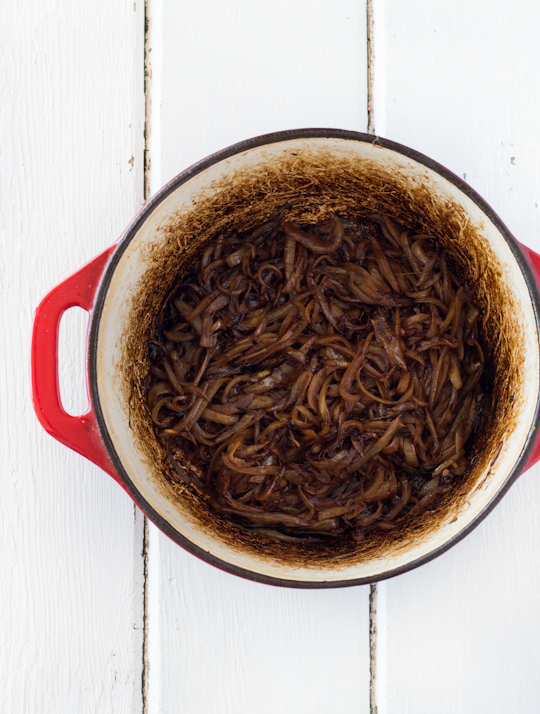 I love caramelized onions and they sound great in your recipe. Can't wait to try it. So glad I stumble by your lovely blog. I love how popular blue cheese dipping sauce is becoming! I've never tried it with sausage rolls though. I sense I've been missing out!